Measles Outbreaks Cause Concern At World Health Organization : Goats and Soda There are outbreaks in rich countries and poor countries, from the United States to Madagascar. And the World Health Organization says vaccine hesitancy is a top 10 threat to global health. Measles cases have spiked globally after years of decline. Here, a family physician prepares a measles vaccine in Bucharest, Romania. Doctors there say that parental hesitancy about vaccines and lack of faith in state institutions have hurt immunization efforts. And now there's a rise in measles in other countries, often wealthier ones, because of what's being called "vaccine hesitancy." Parents are opting out of the routine vaccination, which has been available since 1963 and is credited in helping to nearly eliminate the disease. That hesitancy has played a role in outbreaks around the world. Japan is facing the worst measles outbreak in a decade, with at least 221 cases. Since the start of 2019, more than 70 people have been infected in southwest Washington state, and there have been 17 cases in Vancouver, British Columbia. And in Costa Rica this year, an unvaccinated French boy brought the first case of measles to the country in five years. The Philippines suffers from both problems: continued issues of access as well as vaccine hesitancy. Trust in vaccines faltered after the maker of an anti-dengue vaccine said in 2017 that vaccine may increase risks of severe infections. A recent study found that in the Philippines, those who believe "that vaccines are effective" dropped from close to 82 percent in 2015 to 22 percent in 2018. The result: More than 12,700 measles cases reported since the beginning of 2019, and at least 203 deaths. At least 55 children under age 4 have died since the start of the year at just one Manila hospital. "The vaccine hesitancy movement has really reached this level in certain countries — the United States, European countries, even in the Philippines — where we now are having difficult-to-control measles outbreaks occur, because the level of immunity has fallen," says Amesh Adalja, senior scholar at Johns Hopkins University Center for Health Security and an infectious disease physician. It's a situation that the World Health Organization views with alarm. In January, WHO declared vaccine hesitancy one of the top 10 threats to global health — in the company of such looming problems as the Ebola virus and antibiotic resistant bacteria. Indeed, after years of progress in immunizing children and eliminating or nearly eliminating measles in some countries, those gains have stalled. According to WHO, reported cases of measles increased by more than 30 percent from 2016 to 2017. The reported worldwide total in 2017 was 173,330. A study published in The Lancet this month notes that of the 626,289 cases of measles worldwide from 2013 to 2017, 63 percent were categorized as "preventable" — if the children had received the two doses of measles vaccine, they would not have contracted the disease. "It's very concerning because I think it represents a waste of resources, because we shouldn't be fighting measles outbreaks in 2019," Adalja tells NPR. "This was something that should have been solved with the vaccine in the 1960s. Yet measles has persisted and now it's not so much a question of access to the vaccine, it's actually trying to convince people that the vaccine is worthwhile." And since measles has been virtually absent from many countries for decades, a new generation of parents has little knowledge about its nature. Stephen S. Morse, born in 1951, is one of those who got measles as a kid in New York City. He's now a professor of epidemiology at Columbia University. When he was growing up, he says, nearly all children got measles. That's not the case now, and that's one cause of people avoiding vaccination in places like the U.S., Italy and France. "We've kind of taken it for granted because we see so few cases," he says. "That's the vaccine essentially being a victim of its own success. People don't see a problem; they think it's not there anymore." Those old enough to remember measles may well recall manageable symptoms: a fever, runny nose, bloodshot eyes and white spots in the mouth. Days later, a rash develops, spreading from the face and neck downward. But the disease can be far more serious. Prior to the introduction of the measles vaccine in 1963, measles caused an estimated 2.6 million deaths each year, according to WHO. In 2017, approximately 110,000 people died from measles – mostly children under 5 in poor countries. The European region, meanwhile, had 72 measles deaths in 2018 — not a high number compared to other parts of the world. But the total numbers in Europe reached 80,000 measles cases last year, the highest this decade. While a number of countries have sprouted communities reluctant to immunize, they come by these beliefs in different ways. A global survey published in 2016 found that compared to other regions, Europeans were the most skeptical about the safety of vaccines — and it found that countries with high levels of schooling and good access to health services were associated with lower rates of positive sentiment toward vaccines. 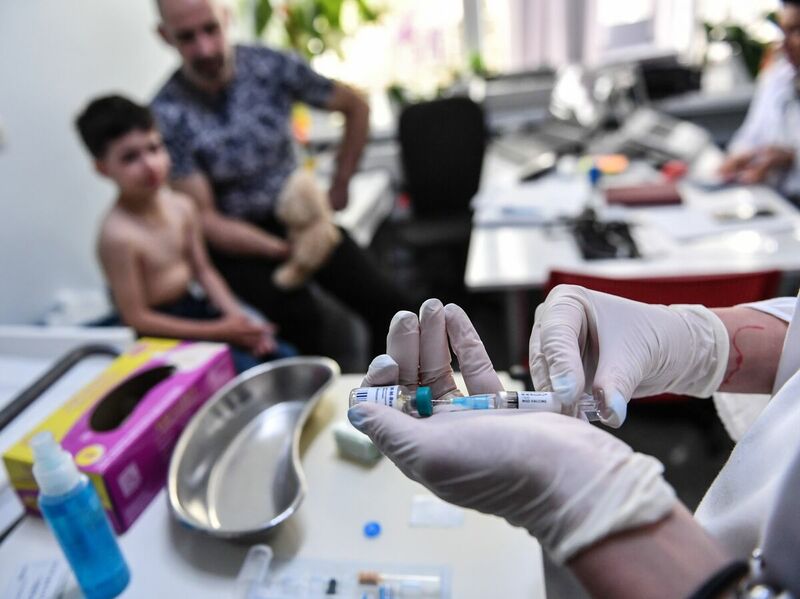 About half of the measles cases in the European Union since 2016 have been in Romania, where doctors told NPR's Joanna Kakissis that parental hesitancy about vaccines and lack of faith in state institutions have hurt immunization efforts. A recent study found that in Europe, skepticism about vaccination has a strong correlation with voting for populist parties. In Japan, nearly all of the 49 cases in one prefecture were people connected to a single religious community that avoided medicines and vaccines, The New York Times reported. After the outbreak, the group apologized and said it would now follow advice to get vaccinated for measles "so that we don't cause concern to others." Researchers have found Japan has higher incidence rates of vaccine-preventable diseases than other developed countries. But if there are all kinds of diseases that people aren't getting vaccinated for, why are there all these cases of measles, in particular? Why aren't other contagious childhood diseases spiking? Because measles is extremely contagious. The virus can live for up to two hours in the airspace where an infected person coughed or sneezed. "It's almost like the canary in the coal mine," says Adalja, the infectious disease doctor. "When you see measles, that tells you that your vaccine levels are low" for childhood diseases in general. And because measles is so contagious, the disease travels easily. So someone from a nation that rarely sees measles might travel to a country experiencing an outbreak, catch the disease and then carry it back home to one of the pockets of low immunization — and suddenly the number of cases spikes. A few of the cases in Japan were linked to children who had returned from the Philippines. Recent outbreaks in the U.S. have been linked to travelers who were returning from Israel and Ukraine, and then spread among U.S. communities with low vaccination rates. In 2011, many cases in the U.S. were imported from France. And it's not just measles. Recently there have been outbreaks of chickenpox in Asheville, N.C., and a rubella scare at the Detroit Auto Show. So how do health officials get the message out that vaccines are a tool to keep the public healthy? Adjala says outbreaks are a grim reminder of how dangerous the diseases can be — and can spur a newfound desire for vaccination. The outbreak in Washington state led to a rush for measles shots. And in the Philippines, the AP reports that 130,000 people were immunized in Manila in just one week during a government drive to stem the outbreak. When a measles outbreak occurs, Adalja says, "people actually get some familiarity — that their neighbor or their friends or somebody got sick and that it wasn't a fun experience — and then they do think maybe they should become vaccinated." And vigilance is important, he says, because ridding the planet of measles is not going to happen overnight. "We're going to still need to maintain population immunity for some time until we can actually get vaccination levels high all over the world, so that no one is at risk. But it is very hard because it's such a contagious disease. And then the anti-vaccine movement has just set that whole effort back a long way."